Lanzarote, popularly known as “the volcanic island”, is the most northern and eastern of the Canary Islands, whose approximate coordinates are 29º 02´21´´ N and 13º 38´15´´ W. It is oval in shape with appendixes at either end: Famara to the north and Los Ajaches to the south, are 55 km apart and only 21 km separate the most eastern from the most western part. The coastline measures 247.49 km. Lanzarote is about 140 km away from the northwest coast of Africa and 1000 km from the Iberian Peninsula. 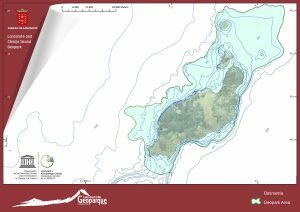 The surface area of the Geopark is almost 2500 km2, consisting of a considerable submerged area that contributes to an increase in the geographical diversity associated with the Geopark and an 886.85 km2 landmass which includes the island of Lanzarote and the Chinijo Islands. The resident population of Lanzarote is 143209 (December 2015). The Chinijo Islands (“little”, in reference to its condition as a mini archipelago) is located to the north of Lanzarote and consist of a group of islands made up of La Graciosa, (separated by a shallow strait of a river, it is the only one that has inhabitants), Montaña Clara, Roque del Infierno and to the west, Alegranza and the Roque del Este. At 700 km2, this is the biggest marine reserve in the European Union. The maximum depth of the underwater platform which connects Lanzarote and the Chinijo Islands is almost 100 m, while Peñas del Chache at 671 m is the highest peak in Lanzarote and La Caldera de Alegranza, at 295m high, the highest in the Chinijo Islands. pristine water, thirsty land, palm-tree oasis, harmony between men and nature. fabulous beaches, volcanic valleys that are threatening and beautiful at the same time. Lanzarote and the Chinijo Islands form a geopark of oceanic volcanic islands with not only an internationally relevant geological heritage, but also of great worth and conservation values, where it is possible to observe the interaction, through more than 15 Ma, between the volcanic, erosive and sedimentary processes, on land and water. All of it backed by the fact that it is an international tourist destination with excellent infrastructures that have been made the most of in order to promote and disseminate their geology, which has been key for the island and islets to become the eleventh Spanish Geopark. In October 1993, a part of the Lanzarote and Chinijo Islands UNESCO Global Geopark had already been declared Reserve of the Biosphere by UNESCO; including 13 protected areas, according to the Canarian Network of Natural Protected Areas with around 350 km2, approximately 14% of the geopark is protected, which reflects the immense natural richness of the island, and how its people have known how to preserve and enhance those values. Since 1974, the Timanfaya National Park has been an internationally relevant geosite, where the historical eruption of 1730-1736 occurred. In this geopark there are almost 70 unique and outstanding places of geological interest (geosites), and 13 of them are internationally relevant. In most of them, the interest is related to their volcanic nature, followed by those of morphological interest. However, the wide range of constructive and destructive processes on the islands results in geological diversity, hence there being geosites whose main interest is stratigraphic, paleontological, sedimentary, tectonically and petrological. The Art, Culture and Tourism Centres of the Cabildo of Lanzarote (CACT, Spanish acronym) are the main economic engine of the island. They were created to enhance and protect the beauty of nature in Lanzarote, excellently combining art and nature. The CACT have become a modern version of traditional intervention of the people from Lanzarote on their environment. All in all, they make up a network and represent a blend of the natural and cultural values of the island. The CACT are located in geological places of interest, and several of them are included in the list of geosites. On this island region, the volcanic processes and shapes are fully focused on tourism. Visitors can understand and enjoy the volcanic landscape promoting the preservation of natural resources. The main objectives that the Cabildo of Lanzarote has taken into consideration when it came to becoming a member of the EGN/GGN include promoting, disseminating and protecting the geological heritage in order to reach the necessary quality and excellence for their area, and improve the competitiveness of their services allowing the personnel of the institutions related to tourism, area management, heritage, etc., to share knowledge and learn from other members of the EGN/GGN networks. Subsequently, developing a sustainable development of the area through geotourism that diversifies high quality products. The “Lanzarote and Chinijo Islands” started out with support from the Cabildo of Lanzarote in October 2013 aiming to become part of the Geoparks Network. The integration process was carried out according to the criteria and demands established by the European Geoparks Network. In May 2014, the assessment committee who visited the island, in situ, was able to confirm that Lanzarote and the Chinijo Islands met the 3 basic requirements in order to become part of the Network and be named a Geopark. These requirements match the exceptional geology of the island, the growth of geotourism in places like the Tourist Centres of Lanzarote, El Golfo, La Graciosa and La Geria, among other spots and landscapes, and the educational and dissemination work carried out to highlight the geological heritage of the island. Having completed a full assessment in April 2015, we were notified of the success in obtaining the “Lanzarote and Chinijo Islands Geopark” certificate; a unanimously taken decision on behalf of the Coordination Committee of the European Geoparks Network at a meeting held in France. The second Canarian Geopark (El Hierro was declared a Geopark in 2014) was announced at the 4th International Conference on Geoparks of the Asian and Pacific Region, funded by UNESCO, in September 2015, at the San’in Kaigan Geopark (Japan), therefore becoming the 65th European, and 112th worldwide. In November 2015, during the 38th session of the UNESCO General Conference in Paris, the member States approved the statutes of a new international geoscience and geopark programme (IGGP, International Geoscience and Geopark Programme) as a specific line of work for the organisation. This allowed the organisation to take a closer look to the challenges related to Earth Sciences nowadays, and provide an international status to an old network of geologically relevant places. The objective of this new international cooperation and scientific research programme, is to facilitate the collaboration among geoscientists with no borders, to conduct joint research work, hold meetings and have workshops. A large number of geoparks from all over the world take part in this programme, including our own. Thousands of scientists from over a hundred countries are involved. Ever since, Lanzarote and the Chinijo Islands have been a UNESCO Global Geopark. 4 years after having been granted this certificate, we will have to pass our first test. Should said test be passed, the Geopark obtains its first green card, meaning recognition of the progress made by the geopark during those 4 years after their initial approval. Otherwise, they could be given a yellow card (in which case, certain issues would have to be looked into and resolved within a 2-year period), or a red card, which would lead to the exclusion of the Geopark from the European and Global Geoparks Networks.